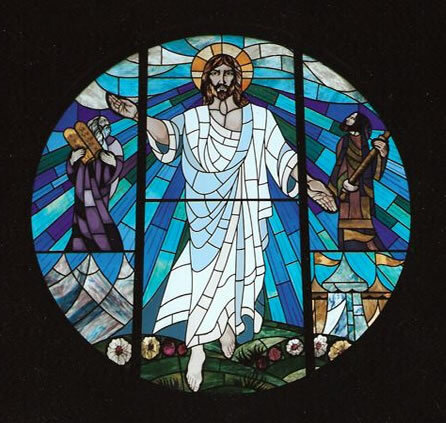 The collect and readings for the Feast of the Transfiguration may be found here. The following sermon is based on Luke 9:28-36. Most of us, I suspect, at some point each day, look in a mirror. We check our hair, our makeup, our teeth, our clothes. Mirrors show us what we look like. While it might be important to know what we look like, it’s more important to know who we are. That’s what this holy Feast of the Transfiguration is about. The Transfiguration of Christ shows us who we are. It reveals our origin, our purpose, and the end to which we must aim. Mirrors show external appearances. The Transfiguration, however, shows the archetypal beauty within creation and humanity. This means that the Transfiguration is not just an event in history, a happening that begins and ends. It is, rather, a condition or a way of being. The Transfiguration reveals a present reality. The transfiguration is already within us and the world. The glorified and transfigured Christ is the prototype of our own creation. Those are pretty bold statements when you consider recent events. Just yesterday at a Sikh temple seven people were killed and others wounded. On July 20 in Aurora, Colorado, twelve people were killed and fifty-eight wounded as they watched a movie. Let us not forget the cloud that overshadowed and the light that incinerated Hiroshima on this day in 1945 with the dropping of the first atomic bomb. Peter, John, and James were also weighed down with sleep. Jesus took them with him and went up on the mountain to pray. While Jesus was praying “the appearance of his face changed, and his clothes became dazzling white.” Moses and Elijah were also there talking with Jesus. The three disciples struggled between sleep and wakefulness. “Since they had stayed awake” they saw Jesus’ glory. He revealed himself to Peter, John, and James and in so doing showed them the deepest reality of who they are. The spiritual journey is always a battle between falling asleep and staying awake, between absence and presence, between darkness and light. Sleepiness is not simply a physical matter, it is a spiritual issue and condition. Spiritual sleep is a form of blindness. It blinds us to the beauty and holiness of the world, other people, and ourselves. Blindness to God’s presence in and the goodness of creation is what allows us to do violence to one another and ourselves. Peter, John, and James experienced the transfiguration of Christ because they stayed awake despite the weight of sleep. They saw for the first time what has always been. They saw the light of divinity fully manifest in a human being, something a mirror can never reveal. Peter misunderstood, however. “Master, it is good for us to be here; let us make three dwellings, one for you, one for Moses, and one for Elijah.” Humanity can never build a dwelling place for God. It is, rather, God who makes humanity the dwelling place of divinity. This is most profoundly revealed in the Transfiguration of Jesus. The whole of creation participates in the glory of God. Humanity alone, however, is called to the Mount of Transfiguration. It is there that Christ reveals who we are and who, by grace, we are to become. The Feast of the Transfiguration invites us to wipe the sleep from our eyes, behold what we are, and become what we see. Raymond I am glad you found the post provocative. Thanks for your comment and for reading my blog. Seems to me the life of discipleship is the work of prayer, purity of heart, love of God and neighbor that brings us to the vision of the uncreated light, the Light of Transfiguration. Thanks for your comment and reading my blog. Thank you Fr. Charles. I’m glad the sermon was helpful. I hope you and your parish have a blessed Feast of the Transfiguration and know the uncreated light to be within you.